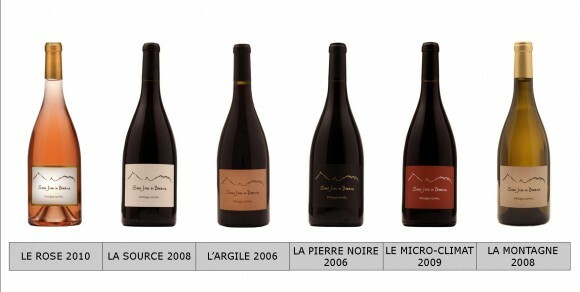 Saint Jean du Barroux: Philippe Gimel Created a Cult Brand, the Hottest Bottles in the Ventoux and Wine Fans Worldwide. How So? What Next? From a marketing perspective, it has been a perfect campaign. When Philippe Gimel purchased the winery that he came to brand Saint Jean du Barroux (SJB), he got on with the task of reinvigorating a vineyard mostly on his own, with an occasional crew of one-shot hires, no wife and no dog. 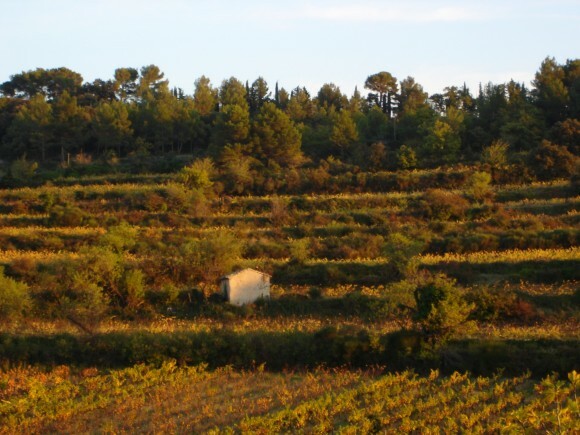 Located in the northern Vaucluse, Saint Jean du Barroux occupies 37 acres of vines in the Appellation Ventoux, which has a patchy reputation for turning out quality wines because 80% of its wine is produced by wine cooperatives. Wine estates there, as those throughout the Southern Rhone, rely on significant exportation of their wines. With the introduction of his first red vintages in 2003-05, Philippe Gimel set course to produce the highest-rated red wines in the entire Appellation Ventoux, and create a veritable cult-like brand sought out by wine fans throughout Europe and the United States, and other far flung locales. Today, demand for his wines far exceeds current production. Deconstructing this extraordinary marketing coup, PVB has delineated nine spheres of activity / strategy that were essential in building one of the most dynamic wine brands in the Southern Rhone. One sphere not included, yet capital in SJB’s success: the personality and charm of Mr. Gimel. Like chefs, vignerons wear where they trained like badges. 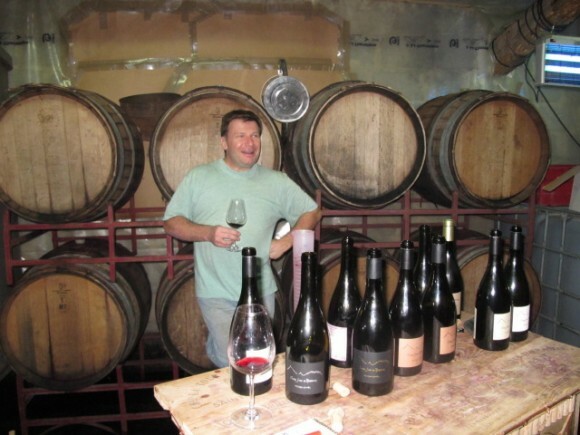 Philippe honed his skills as a vigneron and got connected in the French wine establishment at two elite estates in Châteauneuf du Pape: Domaine de La Janasse and Château de Beaucastel, as well as at Château Pierre Bise in the Loire and Chateau Devès in Haute-Garonne. When Philippe found the available terroir outside of Le Barroux, the bids were regulated by Les Safer, which oversees sale of agricultural land. In March 2003, Safer requested dossiers from twenty-five candidates evaluated on experience, finances, talent and ten-year production and marketing plans. Established vineyards applied. Debutant Gimel’s time in Châteauneuf du Pape was capital. Rest of story is in the bottle. “Simple is as simple can.” The minimalist label design is downright brilliant: a pencil outline of Les Dentelles de Montmirail and Mont Ventoux, and names of the estate and the winemaker in expressive casual fonts. No label cluttered with vintage, year nor appellation (the latter avoids the patchy rep of Ventoux wines). Was Philippe inspired to design a near naked label by an English wine merchant who quipped that he had no problem selling a white wine from Ventoux as long as a towel was wrapped around the bottle? It’s as if the label is giving the buyer a coy wink of the goodness within. The buyer searches for more details on the back label where the education begins. Starting in 2003, Philippe produced a single red vintage Oligocène, a blend of 75% Grenache, 15% Syrah, 5% Carignan and 5% Cinsault. The 2004 and 2005 vintages were Philippe’s calling cards for seeking out importers, distributors, retailers and new customers. They did not disappoint. Currently, the SJB red wines receive scores in the mid-90’s. 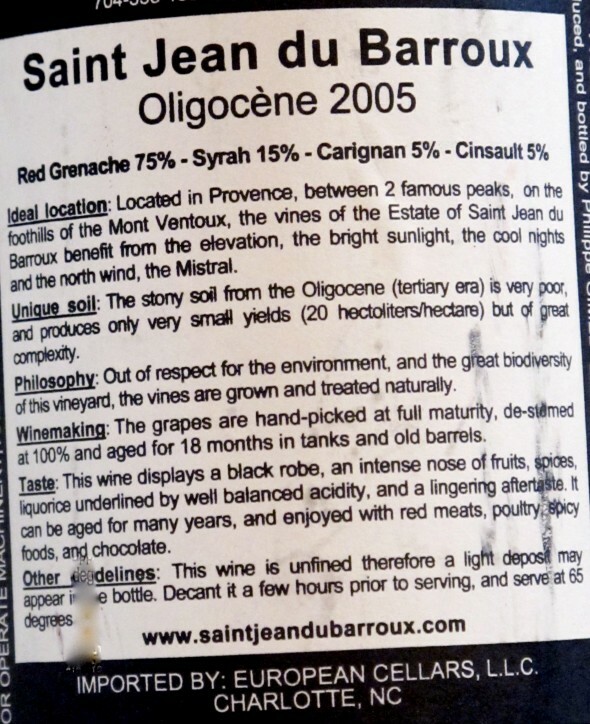 Eric Solomon, who founded the esteemed European Cellars, took on representation of Saint Jean du Barroux. His keen marketing to distributors propelled the sales of SJB wines in the U.S.
For his first years in business, Eric imported exclusively French wines with a preference for the South, and came to know well Robert Parker of the Wine Advocate. 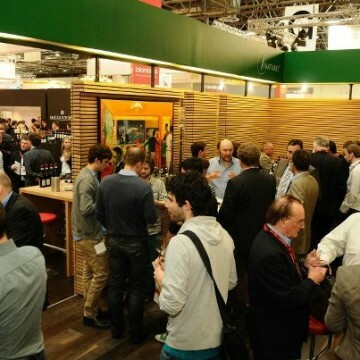 Today, European Cellars imports French and Spanish wines. In 2006 with a move into a new cave with more tanks, Philippe introduced a new product offering with three red wines: La Source, L’Argile, and La Pierre Noir. The Source was known as the Danish cuvée because Philippe’s Danish importer purchased the entire first year’s production before the wine was bottled. The initial La Pierre Noire 2006 received 94 pts from R. Parker, at that time the highest score ever for a Ventoux wine. A year later, L’Argile 2007 topped it with 95/100. 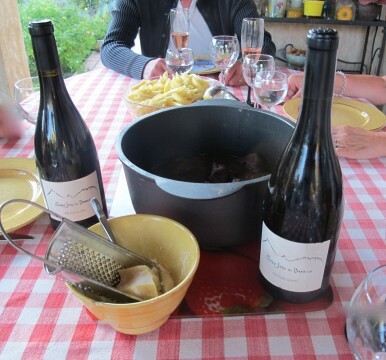 Two limited production vintages – a red Le Micro-climat and a rosé – rounded out SJB’s selection (photo above). In effect, an expanded product line benefits the customer who has a greater choice of styles / blends at various price points while the vineyard increases its revenue by selling its better vintages at a higher prices. Month after month, Philippe is off to present his wines at tastings, conferences and trade fairs.throughout Europe: Denmark, Holland, Switzerland, Sweden, England, Belgium, France, Luxembourg, Norway, Austria and Germany where he was twice last month. Next year, he goes to Brazil and the U.S. It is an exhausting routine: meetings with distributors and retailers, and the acquiring of new devotees glass by glass at tastings and dinners. The most vigorous user among vignerons in the Southern Rhone wine community of Facebook is Philippe Gimel. He multi-tasks online in English and French. He creates buzz for his tasting trips, participation in wine fairs and his own wine releases. He is putting QR Codes on all bottle labels. All visitors, from importer to wine tourist, receive the A-treatment: a tour of the vineyard and a tasting of wines in Philippe’s cave, which is a few miles from the vineyard. There are no chairs in his cave, a marker of the work pace. Philippe’s enthusiasm and charm work to make you feel as if you are a part of a small, niche group of wine lovers, and in effect, you are. At the core of brand loyalty is emotion. Great wine like Philippe’s gets into your head before the first sip, and once in your head the relationship between the wine maker and you, the drinker, crystallizes. Each time you crack open the bottle, this unspoken bond reasserts itself. What’s to come: Acquiring more vines to boost production under the SJB label. Securing a new cave (with chairs) to handle the increased volume. Growing the fan base. Expanding the SJB brand into new markets. SJB written up as a global marketing success story in the Economist? An SJB app? Maybe not, yet anything but a reality show! Esprit d’escalier: What about SJB tees for the happy crew pictured above? Directions: Le Cave is not on the vineyard, located off D938 between Bedoin and Malaucene next to Le Clos Saint Michel. All appointments made in advance. Importers: UK, Dudley de Fleury Wines; U.S., European Cellars. Addendum: On Dec. 10, Robert M. Parker Jr. announced that he is planning to sell a portion of his influential newsletter, The Wine Advocate, to a group of Asian investors and step down as editor in chief. Mr. Parker has been a huge fan of Saint Jean du Barroux since he tasted Philippe’s first vintages. He continues to cover Bordeaux and Rhone wines. That said, one can posit that Saint Jean du Barroux has reached a plateau of consistent excellence that renders scores and rankings of any wine critic of less import to wine lovers. 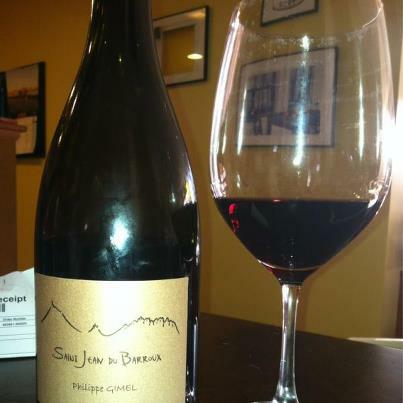 This entry was posted in Wine and tagged Philippe Gimel, Wine. Bookmark the permalink.